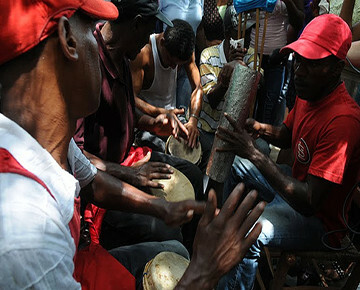 Palo is an Afro-Dominican sacred music. The drum and human voice are the principle instruments. Palo is played at religious ceremonies - usually coinciding with saint's days - and at special occasions. With roots in the Congo region of central-west Africa palo shares much the same pantheon of deities/saints as the Afro-American religious traditions of Cuba, Brasil, Haiti and elsewhere in Latin America.